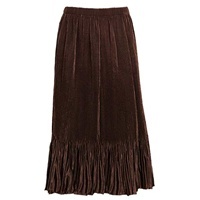 Slinky skirt with faux buttons can be worn with coordinating tank top or short sleeve top. Made in the USA. 90% polyester, 10% spandex. Hand or machine wash in cold water and let it dry naturally. Never wrinkles - great for traveling.